Find out if Berklee College of Music is Affordable for you. Can You Afford Berklee College of Music? Concerned about paying for college? Take a look at Berklee College of Music's financial aid options, including grants, scholarships, and student loans, then calculate the net price based on your income level to determine if you can afford to attend this school. Feeling a little stressed about paying $63,574 to attend Berklee College of Music each year? This number can be deceiving, and for many, the net price you pay will be less. While there is no tuition reduction for Massachusetts students, 60.8% of freshmen receive some form of financial aid, with the average amount totaling $18,519. Students from low-income families receive an average of $21,599 in aid during their first year. Learn more about tuition and fees, room, board and other expenses, and financial aid options at Berklee College of Music. Projected Costs Between $171,038 and $382,624 For a Four Year Degree. Between $85,067 and $186,645 For a Two Year Degree. Looking at the total projected cost of a college education over the course of two / four (or more) years can feel a little overwhelming. However, doing so will help better prepare you for the financial commitment you are making. The overall cost for on-campus students to attend Berklee College of Music in 2017 - 2018 was $63,574. To calculate future costs, we looked at the prior five years of data and determined that this cost increased an average of 2.5% each year. If this trend continues, we expect the full cost for incoming freshmen to be $66,753 during their first year. By their senior year, that cost will be approximately $71,823 for a bachelor degree candidate ($68,402 for an associate degree candidate) for a total of $277,070 over the course of four years ($135,155 over the course of two years). These numbers do not take into consideration financial aid, which reduces this overall cost by varying amounts per student. Remember, the full costs quoted above are not what most students will pay, and the net price varies quite a bit based on individual circumstances. The tables below outlines how the overall degree net cost can vary depending on your situation. This table also highlights the impact student loans can have on the overall cost of college. 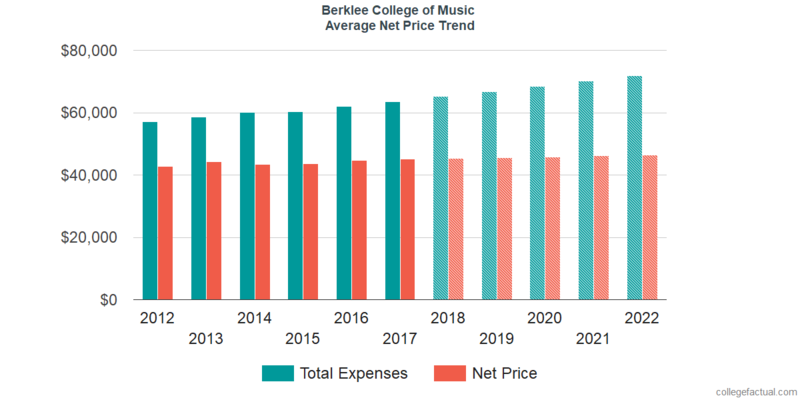 Visit net price and financial aid to learn more about the total cost of attending Berklee College of Music. Do you know your deadlines? Meeting application deadlines for both the college and the FAFSA is crucial to getting financial aid. When can you expect to begin receiving bills from the college? Is there an option to make payments in monthly installments?